Native to Asia and northern Africa, tamarind is a fruit that grows in pods, which contain seeds and sour pulp. It's used to lend a sour flavor to certain Asian and African recipes. 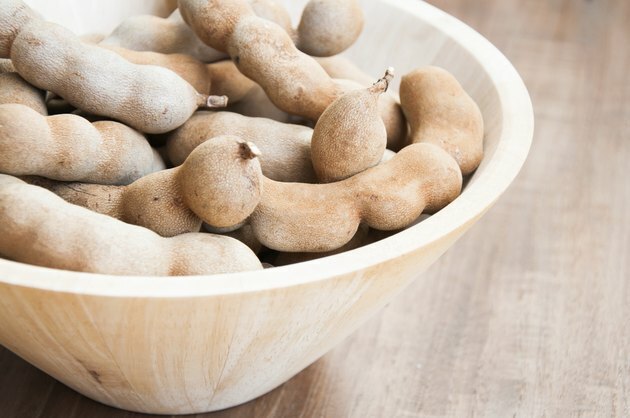 Tamarind has also been used for medicinal purposes, such as for treating colds, constipation and nausea during pregnancy, according to Charmaine D'Souza, author of "Kitchen Clinic: Good Health Always With Charmaine." The fruit is safe during pregnancy, as long as you consume it in moderate amounts. Of course, you should always ask your doctor before adding new foods to your pregnancy diet. One cup of tamarind pulp contains 3.36 milligrams of iron, which is 12 percent of the 27 milligrams of iron pregnant women need as part of their daily diet. Iron is essential because it helps support your increased blood volume, but it can also lower your chances of premature delivery and your baby's risk of low birth weight, according to the American Pregnancy Association. That same amount of tamarind also supplies 2.3 milligrams of niacin, which is 13 percent of the 18 milligrams you need each day during pregnancy. Niacin promotes normal development of the skin, nerves and digestive system.Tamarind supplies small amounts of vitamins A, C and K, as well. Tamarind is an impressive source of dietary fiber, with 6.1 grams per cup. That's 22 percent of the at least 28 grams of fiber you should have in your daily diet, according to the Similac website. Eating a diet rich in fiber is one way to prevent constipation, a common pregnancy complaint. Getting plenty of fiber might also help prevent you from gaining too much weight. Fiber fills you up, which can help keep you from eating more than you need to keep yourself healthy and to promote normal fetal development. Tamarind has long been used to help relieve the symptoms of morning sickness, writes D'Souza. The compounds in tamarind can have tummy settling effects, which can help ease some of the nausea and vomiting most pregnant women experience during the first trimester or so of pregnancy. Dr. H.K. Bakhru, author of "Indian Spices and Condiments as Natural Healers," notes that sucking on a piece of tamarind that's been sprinkled with salt and pepper can be an effective treatment for morning sickness. Always ask your doctor before using tamarind as a morning sickness treatment, however, to be sure it's right for you. If your doctor gives you the go ahead to eat tamarind, look for it in specialty Asian, Indian or Mexican markets, the Fine Cooking website recommends. The fruit is harder to find in fresh form in most supermarkets, though some large grocery stores might stock frozen tamarind or bottled tamarind concentrate. In addition to sucking on fresh tamarind, you might also consider using the fruit to flavor homemade sorbets, salad dressings and beverages, such as fresh lemonade.